At least 52 percent of ticket revenue goes to pay for the ticket system, not the actual PT system itself. This is ridiculous. PT should be free…. The ticket system has raised heaps of revenue for the public transport system. $357 million a year according to the Department of Infrastructure. * But it has costs. There’s no official figures, so I’ve made some estimates. Public servants required to administrate the ticketing system and law surrounding it. Not sure. Round to zero. Legal costs of disputed ticket cases? Not sure. Round to zero. 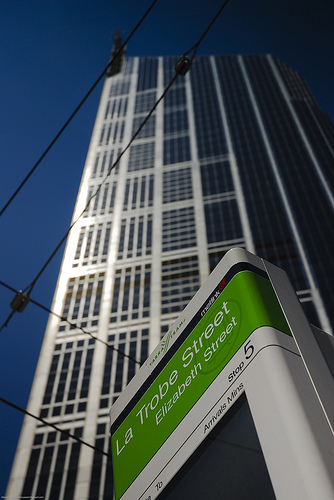 Two to five percent fewer seats on every tram, to make room for ticket machines. Value? Not sure. Round to zero. Total annual ticket system cost: 130 + 55 = $185 million. Minimum. The net loss from getting rid of tickets would be around $172 million. So the system, if it was a business, would be profitable. But its not a normal business. We already provide $456 million to the operators each year through the tax system. Why not add another $172 million? If we provide the whole lot, we save users a whole lot of money that ends up 52% spent on the collection and enforcement system! In theory, Melburnians could each pay 50 bucks more tax and get free PT. Until then, a weekly zone 1 ticket costs $28. Have fun, Melburnians. Put it another way – if the same outlays were channeled from users to the PT system via the government rather than having a ticket system, there’d be an additional $185 million a year to spend on improving train and tram services!! That’s significant. The rationing merits of user pays. Price maybe keeps off the marginal people who would make it too busy. also might keep off homeless people etc that make PT uncomfortable for the average user. Its easy to say that if people don’t pay for a service, they don’t value it. Is this true? Effect on transport planners – less focus on maximising patronage? It could end up that peak hour services are cut in favour of low-volume ‘welfare’ services, like your lunchtime bus through the suburbs. The start of free PT could be the end of good, customer-focused, transport planning. Foregone passenger data. Ties in with #3 above. Finally, the problem is that the Myki expenditure is already a sunk cost, so the capital cost is not a relevant part of calculations. However, when it comes time to spend a trillion bucks to replace myki (perhaps in a few years) this calculation becomes relevant again. Would you pay 50 bucks more tax to get free PT? Are my calculations wrong? Is this whole theory crackers? What do you reckon? Good work with the figures. So we pay fares to pay for the fare system. Nice. I’d say the main benefit of fares is #2. If demand went really high then there would be heaps of infrastructure costs, but otherwise your argument is pretty compelling. If a commuter could save 28 bucks a week would the State in equity subsidise my diesel by $28 a week? Or would they support only penniless city dwellers who don’t contribute to the economy by owning a motor vehicle, and probably ride a bike,,causing accidents by riding too close to parked cars’ doors when people are alighting and imposing other costs onto the communal purse? If they spent the roads budget on putting tolls on every road, there’d be a lot less money for fixing potholes! – a “lack of respect for the product” – I know that sounds a bit airy fairy but if people don’t pay for product they tend to abuse it in many ways. If actually being free would be the only or main problem with a system like this, why not have a $70 ID card saying that you’re a paying PT user, with your 50 fee and 20 to laminate the paper….might keep away those with no fixed address, and make users feel special enough not to leave their hungry jacks rubbish behind. Agree with last 2 posts. Free PT would lead to a system with no respect, no funding for improvements (Treasury would say they are getting enough) and heaps of vandals, homeless and crime (fare evasion can be used by Transit Police to fine those who are behaving badly, but not badly enough to arrest for any other offence). You seriously can’t tell me that people respect the system as it is now. If someone is going to litter or grafitti, then they’re going to do it. Whether they pay for it or not is inconsequential. Another flaw is that it assumes that AO’s only do ticket inspection. A large amount of their work is providing a security presence on trains, and dealing with co-ordinating people when something has caused part of the rail (or tram) system to go belly-up, such as a fatality or rollingstock failure. And at what point do you have it free? Where do you stop? The greater Melbourne area is pretty damn big. That said, I’m yet to be convinced that myki adds much more value than kennett’s option, a $2 coin in the turnstile. 19th century technology that would still do the job today. You could even put $2 in the slot of zone 1, and open barriers at the end, but segregate the trains for zone 2 – Frankston past Moorabin, Ringwood past Box Hill, Dandenong past Westall and so on, and have a surcharge $2 for those zones as well (eg a general $2 to enter FSS, and another $2 at the entrance to Zone 2 platforms) with trains to zone 2 running express. And then the turnstile prints out a little cash register receipt which can be used on a connecting bus or tram. Afraid I agree with ricc and notch. To my mind the issue is that the cost of public transport is two-fold for a consumer – out of pocket cost and time cost. For out of pocket cost (ie ticketing), public transport is really already cheaper than the marginal cost (let’s not get into the fixed cost of buying a car) of its closest substitute the car. So in that sense I don’t see it as a barrier to public transport use. But for the time cost, public transport is often much slower than a car for many trips, and really does stop people from using it. I’d rather scarce resources are spent on getting end to end journey times competitive with cars as opposed to making an already cheap service free. Thanks Phin, and also for your excellent proposed train system map that i linked to! I like your realist logic that scarce resources should not be wasted making a cheap system free. But while we’re kicking a theoretical ball round a theoretical field, I want to make a few points. The cost of raising those scarce resources is high, so that the moving parts of the system only get half of what the consumer pays. If the ATO itself consumed half of tax revenue, would a more efficient government financing system be proposed? I agree with ninthnotch and riccardo that making the system free would have freaky and unwelcome consequences. It would be interesting to get a feel for their magnitude. Policy making is the art of balancing intended and unintended consequences. Focussing on the unintended consequences could mask a big truth, that people would benefit to the tune of at least 180 million (being the out of pocket ticket costs less ticket system cost). There are some public services/spaces that are provided free that people feel great affection for, such as public squares and public primary education. Could a culture of public support be cultivated around PT? And if so, could the benefits outweigh the negatives? Further benefits could flow to consumers whose willingness to pay to travel was just under the old ticket cost, say Pensioners and unemployed people living in Zone 2. I am inspired by Jarret’s article at Human Transit that argues that ‘British’ transit planners have a too-strong focus on the ‘profitability’ of transit. From it I take the idea that transit needs ‘champions’ and that like the road system, transit could be advocated as a system that should reach everyone, rather than viewed solely as a business. Here I play the ‘theory of second best’ card. In the absence of market distortion, user pays is best. But PT is competing with a non-user-pays system, so we can apply substantial discretion in applying market theory. I can’t imagine the RACV saying that local roads should be tolled to maximise the scarce resources that are available to the road system. It’s the wideheld view that roads are a right that makes this suggestion preposterous. Why can’t PT have those sort of champions!? Why are we so afraid of road pricing. It also has winners and losers among the driving set. Of course you can price local roads. You won’t want some massive Citylink style gantries, but something sensible could be arranged. If we really understood that 10% of Melbourne’s area is under bitumen, that 10% is worth several billion dollars as an asset and no-one except Jo Taxpayer is paying for it – might change the dynamic somewhat. Since when did “one good subsidy deserves another”? Pricing of private motor transport is another example of market failure – fixed cost versus variable. Fleet managers and the ATO correctly identify a ‘cents/km’ approach to pricing road transport. At 70c a kilometre, a round trip from Pakenham to the CBD in the morning would cost you $70. Are you going to pay that to get to work? Would give a lot of scope to raise the rail fare as well. And finally, would ensure that urban sprawl was killed and killed dead. No-one wants to pay $350 a week to commute. People are not paying the full costs of their transport decisions. Transport is being subsidised not to meet transport objectives (eg congestion) or environment objectives (eg pollution) but as welfare. That’s not second best – I’d guess at least fourth best. And don’t give me “Australians love urban sprawl”…. If we went down the USA path, imagine we were a 2nd/3rd tier city like Houston. Until recently (with the light rail) essentially a freeway/sprawl city loved of Wendell Cox and co.
With the $1b Melbourne spends annually on subsidising the public transport system NOT being spent in Houston, the latter could easily subsidise the construction of freeway after freeway. We could have gone down the same path. Instead we kept the rail system but not enough money to expand it, nor enough ridership to generate the congestion and the political will to improve it. And we’re stuck with the Alameins and Hurstbridges and Belgraves and so on, lines from another age, not only requiring excessive subsidy but also creating operational headaches that make running the system proper much harder as well. Just a quick rant on road pricing – I say we should just bite the bullet and make it happen! Peak oil will kill a large chunk of road transport anyway, so we shouldn’t be so scared of relatively modest increases now. 4. oft discussed congestion pricing is is problematic because a. congested roads are often slower, already providing a time opportunity cost (indirect) price signal; and b. a congested road is really making a better return as it is actually being used (as opposed to an empty road, which nevertheless needs to be maintained), so perhaps that would suggest inverse congestion pricing? The bottom line is that it would need to be demonstrated that price per kilometre varied so wildly that it justifies paying the extra money for the tolling infrastructure, and I don’t think we’re there yet. oh and just to clarify – I accept that a tolling model for roads would need to include congestion pricing, although the latter is contingent on the former. Accept the counter-intuitive logic of the empty road versus full road – the literature says a freeway lane holds 2000 cars per hour before turbulent flow – so a number near this would be the definition of congestion. Above that level the road is prima facie congested and in need of charging. The only problem with fuel has been the off-road and ‘never on a congested road’ user mainly in rural areas. And these latter users may never see an alternative from syphoned off funds, even if they pay these charges. Still, fuel is a good place to pick up the tax, administratively simple especially with the supply cartel. I would instead do a wired-in GPS system, load GPS maps that delineate which roads and (more importantly) cordon points charge for use and at what rate. You could even make these more flexible around day and time with a demand driven feedback loop – say 1km from the Tulla and Calder junction, the system tells you if you go to Sunbury via Tulla will cost $3, if via Calder $2 and you therefore choose, based on actual road conditions. If enough people select the cheaper option, congestion on the Tulla reduces back to useable level. Anyway probably sounds weird that I would support complex electronic road charging and coin turnstiles for PT – but I would be more confident in a robust electronic system being bought (off-the-shelf?) for road use than the clowns who run PT doing it. I’m not sure the ‘time penalty’ of the congested road is the ‘solution’ – it is the ‘problem’ because a public good is being overused, and some of the users have better claims to using it than others, and are having their consumption impacted by others with less valid claims. Hence the congestion charging is the solution to the problem of time penalties. I think the more pragmatic argument is if 6000 people want to sit on a stationery freeway for an hour twice a day when tere is a perfectly good railway next door, then leave them to it. c) unrelated markets, such as land development, city property development and accommodation for corporations are essentially driving demand in this market, because transport is a complimentary good, rarely consumed on its own – and these markets have their own perversions eg Giffin Goods, externalities and so on. Sorry for coming late to this conversation, and to take it back to the original point. I’d be more convinced by arguments that free transport isn’t well respected if the existing system wasn’t already considered with contempt. There are all sorts of reasons for public spaces (and that, essentially, is what p/t is) being respected or not, and payment is not necessarily the most important of them. I dare-say too, that the perceived private ownership of the system engenders less respect than a fully public system might. Similarly, treasury already perceives p/t as a massive drain on their funds. What the system needs is a better funding model. One thing I’d like to see is a centralised funding scheme, where local transport is funded locally (with cross-subsidies for equity reasons) and city-wide transport centrally. But back to ticketing. One thing I agree with in ttte’s post is that tickets are a really expensive way of pulling in funding. When labour was cheap in the 19th century, tickets made sense, but that is not the case anymore, and a model that (essentially) requires blanket human coverage of every line/station is always going to cost a lot to run (regardless of IT debacles). As it is, a blanket system is so expensive it is much cheaper to have few inspectors and a relatively high level of un-ticketed passengers with a heavy fine to “encourage” people to pay their way. The second thing I’d note on that, is that the main consideration for a funding model should be the incentives it creates. The need for simplicity in ticketing (zones, multi-modal), the size of the subsidy, and a lack of extra incentives (peak-hour pricing) mitigate against people wanting a more efficient system. It would be much better if the funding model made it more obvious that passengers (or non-passengers through subsidies) were paying for a particular type of journey, yet without the expense and inefficiencies of revenue raising that a ticketing system entails. Hi Russ, thanks for your post. I don’t buy that because the graffitists and ferals go to town, therefore that is the fault of the ticketing system. My take on PT has always been the sociological – the ‘winners’ and the ‘losers’ and so long as PT is on the side of the ‘losers’ it will always suffer. The graffitists and ferals are drawn to ‘losing’ oddly enough. I ask myself, even though the sanctions are low, why don’t I see ferals in the big shopping centres, the big CBD office buildings, at the airport, out on the harbour on boats or whatever? I don’t think it is just money – I think there are visual cues that fire off automatically in the grey matter – you are not welcome here. I’ll give you a bizarre example – a Coles/Shell servo near me is big, brightly lit, relatively expensive as servos go, and has well-to-do people constantly coming and going from it (people not sensitive to the petrol price). I never see ferals sitting around outside it – though I see plenty more at 7-11s nearby. I think subconsciously the servo has “winner” written all over it, and that puts them off. I like your logic about labour costs and ticketing, although I think the low cost of labour is more about HOW the ticketing was done in the 19th century, not that it exists at all. The post office sold postage stamps so that they could get revenue, but allowed the user to compose the correct number and value of stamps on each letter/parcel – a user friendly system. I suspect the bigger issue is that point to point, cumbersome ticketing systems survived far too long on the suburban systems at any rate, because they turned into suburban systems while the politicians weren’t watching. And it was a circular relationship. If you decide ex ante that Gosford or Pakenham have to be staffed, then you will probably conclude that to keep the staff occupied you need something like a ticketing system that does so. If OTOH 100 years ago you determined that these places could survive on a limited zone system, maybe that you bought 1 of the 3 or 4 possible tickets from the post office and that the number of points of contact between the public and revenue system were thus minimised, you then might have tackled the staffing on stations back to the functions that were necessary. The airlines are going through this right now. Removing check in as far as possible, removing the thousands of miscellaneous services they have always indulged in, from on-board food to sending parcels, unless it makes a profit or is outsourced. You are basically left with a flying bus but for many passengers, that was all the value proposition ever was – get me from point A to point B. The rest was overservicing the market, and as long as cross subsidies existed people indulged. Now they are paying. Planes used to have fancy ticket books. Once they were needed, but by the 1980s they simply weren’t needed – the computers had all the records, but they took 20 years to get out of the system. A lot of the reasons for keeping them were pretty extraneous to the requirements of the airlines – the ATO supposedly wanted business travel records in hardcopy, the Immigration and Customs departemts supposedly wanted official looking plane tickets to prove you were genuinely travelling and so on. Now you can print it out on your home computer, or even not do it – just turn up with the code number in your head. So I distinguish technology from the labour force arguments, which I tend to see as job creation rather than genuinely needed. I certainly agree with congestion and peak pricing – though you need to check the incentives against other modes like road. Eg you might want to stop people getting off at Town Hall – but you would still prefer that to driving into the city, I would imagine. Riccardo, I think we agree. It’s not paying or otherwise that determines how people treat a system. Federation Square is free to enter and people treat it well. It’s a combination of active surveillance (cameras) and passive surveillance (crowds), plus a sense of value that mean a place is treated well. An empty train carriage at the end of the line is always going to be a good place for vandals. Can we combat that through train design and active surveillance? As Phin notes, the change in dollar cost is not likely to significantly change peak-hour demand, which is more likely rationed by time and comfort costs. I think a move to ticketless PT would deliver economy-wide efficiency and be a massive fillip to perceptions of the system. People might feel that Melbourne’s PT was special for being free. It might grant a greater sense of communal ownership. At the moment they just feel like they are getting screwed by the system, the ticket machines and the inspectors. The major risk is the subsequent funding. An enlightened government might still fund on a per-rider basis (ridership established by surveys administered by an agreed independent party). Previous Previous post: What makes a good hostel?